A pair of strange deaths occurred in Rio de Janeiro, Brazil in 1966. To this day, the deaths of two men found under what can only be described as unique circumstances, have yet to be explained. In fact, it is still unclear whether the deaths were self-induced, worthy of a pair of Darwin awards or murder. The deaths are odd enough, given that two relatively healthy middle aged men just up and died together, but there were also a handful of objects with the men that made the case even more confusing and led to its popular name — The Lead Masks Case. On August 17, 1966, two electronics repairmen from Campos dos Goytacazes left town saying they were going to buy supplies for work and a car. They allegedly had the money for a vehicle with them. The men — Miguel Jose Viana and Manoel Pereira da Cruz — later stopped at a bar to get a bottle of water. The bartender later said that Miguel appeared to be in a hurry as he was frequently checking his watch. That was the last any one saw of the pair alive. 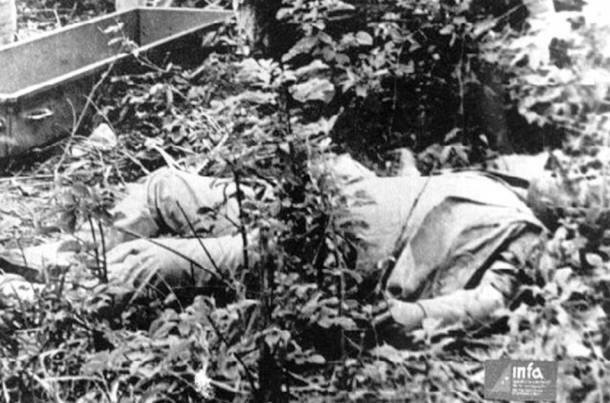 Three days later, Jorge da Costa Alves found the bodies of the two men on Vintem Hill in Rio de Janeiro. Naturally, he alerted the police, who conducted an investigation. They ascertained the last known whereabouts of the men and discovered the miscellaneous items that represent their last moments alive. Both men were dressed in suits and wearing waterproof coats. They had lead eye masks with no holes, such as one would wear to protect from radiation. There was also an empty water bottle, two towels and a notebook. The notebook confused the case even further. It contained a few notes in Portuguese. Translated, they read: “16:30 be at agreed place, 18:30 swallow capsules, after effect protect metals wait for mask signal.” The money for a car was not found. None of these items present any answers; they only pose more questions. The Suits: The suits suggest that the men were meeting someone. However, without knowing their usual attire, it is hard to say. The Lead Masks: The lead masks suggest that the men were expecting radioactivity. The problem is that no radiation was detected at the site. There is the possibility that Vintem Hill was not the “agreed place” and that the men needed the masks elsewhere. The Towels and Jackets: The towels indicate that the men were expecting moisture, as do the jackets. There simply is no explanation for this. There were claims that UFOs were seen in the area on the 17th and the Hitchhiker’s Guide to the Galaxy does say that towels are essential for space travel. Unfortunately, the guide was not published until more than ten years later. The Water Bottle: This one is easy. They were supposed to return the bottle to the bar. They drank the water, it seems, but were unable to return the bottle. The Notes: Herein lies the biggest mystery. Who were they meeting at the arranged place? Were they meeting a person or hoping for an event? Was Vintem Hill the arranged place? We have no way of knowing. Then, there are the capsules. Most sources say toxicology turned up nothing because the organs were not preserved. Therefore, we do not know if the men took the capsules or what they contained. To be literal, we are not even sure if the notes refer to that day, though at least that seems likely. “Protect the metals” may refer to some metals they were meeting to get rid of. “Wait for mask signal” obviously means they were waiting for someone to tell them to put on their masks. One explanation is that the men were meeting someone for a clandestine deal involving radioactive material. However, that would not explain the capsule mention, the towels or the jackets. Another explanation is that they were conducting an experiment, but there is no evidence of an experiment leading to their death, such as materials for said experiment. They may have been duped, murdered and dumped on the hill, though there was no evidence of violence or violent injuries. They also may have been waiting for an intergalactic ride. This entry was posted in Mysteries and tagged Brazil, Rio de Janeiro, THE LEAD MASKS CASE. Bookmark the permalink.